Kevin Costner plays a former Sixties idealist who runs a farm in Iowa with his wife and young daughter. After hearing a mysterious, heavenly voice one day, Costner turns one of his cornfields into a baseball diamond. Of course, everyone thinks he's crazy, but in time "Shoeless" Joe Jackson and other ghostly outcasts, who had previously languished in a sort of baseball purgatory, show up to play the game they still love. Soon men from all over the country join them at this baseball shrine, some just to play with the greats, others to mend the broken relationships they had with their fathers - But all are trying to get back in touch with simpler times through the purity of America's grandest game. My guess would be that anyone reading this probably likes to own movies and to watch them more than once. For the most part, that's a good thing and I agree with it. However, I think there are some movies that should not receive additional viewings. This is not because these films are poor; in fact, I mean pictures that I liked the first time. I refer to flicks that simply don't hold up well to the second screening. Whatever affection I originally had for the piece gets destroyed. You know, right now I'm not even terribly sure what turned me off about Dreams in the first place – or second place, I guess - but I think it was probably the frequently overly reverent attitude it displays towards baseball. This isn't because I don't like the game; in fact, I'm a lifelong baseball fan who counts it as easily my favorite sport. Nonetheless, I can't stand the whole "baseball as America" rhapsodizing that so frequently occurs. Whenever baseball starts to get viewed as some sort of mythological, unifying source, that's when I head for the exits; please keep George Will, Ken Burns and their ilk away from me. Not that I deny the ways that baseball can tie people - especially fathers and sons - together. I can definitely relate to the experiences of Ray Kinsella (Costner), who never knew how to talk to his dad but could usually connect to him through baseball, so I perfectly understand the message being sent. I think that's largely the reason Dreams works for so many people, because lots of us see our own experiences depicted on the screen. However, some people push the baseball-equals-America metaphor way too far, and that's what turns me off. Thankfully, Dreams usually avoids that trap. I could have lived without Terence Mann's (James Earl Jones) speech at the end, but other than that, there's not too much baseball religion happening here. Really, as has been said many times before, the movie isn't about baseball; it's about relationships and regrets, and baseball simply is the vehicle that motivates the story. Enough philosophizing. Suffice it to say that Dreams is an effective, well-made film that moves slowly but steadily and resolves with a nice emotional payoff. Although I'm not wild about Amy Madigan - just a little too spunky for my liking - the acting's uniformly good and both cinematography and score are fine. Dreams will never make my top ten favorite films list, but it's a good movie to watch on days when you feel bitter or depressed (I call those "days that end in ‘Y”"). 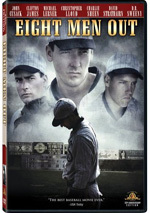 Field of Dreams appears in an aspect ratio of approximately 1.85:1 on this single-sided, double-layered DVD; the image has been enhanced for 16X9 televisions. Only a few minor problems popped up during this generally solid transfer. A wee bit of softness crept into the image at times. I thought a few wide shots seemed slightly ill-defined, but not to a significant degree. Instead, the majority of the movie appeared accurate and concise. Jagged edges and edge enhancement created no concerns, and only a little shimmering occurred. As for source flaws, I thought grain was a little heavy at times but never became distracting. Other defects were essentially absent; other than a couple of small specks, this was a clean presentation. Dreams went with a rich, warm palette that came across well. The colors were consistently lively and well-rendered, as they fit the movie’s designs in a satisfying manner. Blacks seemed dark and firm, while shadows were usually good. A couple of low-light shots were a bit dense, but those were the exceptions to the rule. Overall this was a pleasing transfer. Positive thoughts greeted the audio of Dreams as well. This DVD included both Dolby Digital 5.1 and DTS 5.1 soundtracks. Other than the usual higher volume level for the DTS version, the pair sounded virtually identical to me. Once I adjusted the volume, I couldn’t tell the difference between them. I expected Dreams to come with a subdued soundfield, and that was almost always the case. Music demonstrated fine stereo imaging, and the mixes conveyed a good sense of the various settings. On occasion, we got a little more life from the material. For instance, the first instances of the ghostly voice popped up in different localized spots, and a few baseball scenes opened up to the rears as well. Those examples created a little auditory pizzazz in this gentle mix but didn’t stand out as awkward or unnatural. The general impression left by the soundfield was one of minor reinforcement. Audio quality seemed fine. A few lines sounded a little stiff, but most of the dialogue was natural and concise. Effects played a small role and fit in with the track well. Those elements appeared accurate and well-defined. Music fared best of all, as the movie’s score appeared lively and rich. This wasn’t a slam-bang pair of soundtracks, but they were more than satisfactory for this material. How did the picture and audio of this two-disc “Anniversary Edition” compare to those of the prior DVD? Both provided substantial improvements here. The anamorphic transfer was tighter, cleaner and clearer than the old non-anamorphic version, while the audio offered a broader soundfield and stronger fidelity. The new DVD looked and sounded much better than its predecessor. This set includes a long roster of extras. Some of these appeared on the old single-disc release, and we get some new components as well. (We also lose many pieces from the prior disc; I’ll detail those later.) I’ll mark this version’s exclusives with an asterisk, so if you fail to see a star, then the supplement also showed up on the old disc. On DVD One, we find an audio commentary with director Phil Alden Robinson and director of photography John Lindley. Both sit together for this running, screen-specific chat. 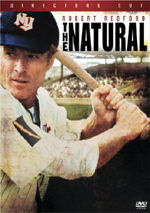 They discuss story issues and the adaptation of the original novel, sets and shooting in Iowa and elsewhere, cast and performances, baseball training, visual issues and cinematography, score and audio, various effects, and general production notes. *From Father to Son: Passing Along the Pastime runs 38 minutes, 39 seconds. 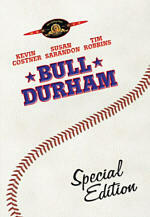 It features notes from Robinson, producers Lawrence and Charles Gordon, actors James Earl Jones, Timothy Busfield, Dwier Brown, Amy Madigan, Ray Liotta, and Frank Whaley, Sports Illustrated’s Tom Verducci, and ballplayers/coaches Barry Zito, Dusty Baker, Mike Scioscia, Mickey Hatcher, Ben Sheets, Chris Capuano and Jeff Huson. The program looks at the project’s path to the screen, casting, shooting in Iowa and stories from the shoot, and some reactions to the film and its elements. 13 *Deleted Scenes appear. Including optional introductions from Robinson, these full a total of 16 minutes, 49 seconds. (They go for 11:05 without the intros.) As you can tell by the running times, all of these sequences are quite brief. They vary in quality, but they remain consistently extraneous, so I’m glad Robinson cut them. In his intros, the director offers thoughts about the segments and sometimes tells us why he dropped them from the flick. He includes some nice notes, though I wish he’d always cover the reasons for the deletions. DVD One opens with some *Previews. We get ads for Along Came Polly and Reality Bites. As we shift to DVD Two, we find a *Roundtable with Kevin Costner, Bret Saberhagen, George Brett and Johnny Bench. This 29-minute and 54-second piece features the actor and the three former Major Leaguers as they chat about the movie as well as how baseball impacts father/son relationships and other facets of their lives. A lot of this tends to be gushy praise, but some of the comments prove interesting, especially as the ballplayers discuss their impressions of various aspects of their careers. Next comes a featurette called *Galena IL Pinch Hits for Chisholm MN. It lasts five minutes, 35 seconds as Galena historian Steve Repp takes us on a tour of the town that “played” Chisholm in the film. Repp gives us some nice notes about Galena in this short but useful piece. *The Diamond in the Husks goes for 17 minutes, 40 seconds and features a tour of the Iowa field used in Dreams. It also features some comments from the owners of the site as well as Robinson, visitors and field workers, and members of the “Ghost Players” team that plays at the spot. A few minor tidbits emerge here, but most of the show feels like a long love letter and ad for the location. It’d be fun to visit, but I don’t need 17 minutes of fluff about it. After this we locate a Bravo special called *From Page to Screen. It fills 46 minutes, five seconds and includes notes from Costner, Jones, Robinson, Madigan, Lindley, Charles and Larry Gordon, Busfield, book editor Larry Kessenich, author WP Kinsella, and Universal Studios chairman Tom Pollock. “Page” examines the original novel, problems getting financial support and the book’s adaptation, more studio complications and production elements, and the film’s reception. *America’s Stadium Trivia splits into two areas: “Fascinating Baseball Trivia” and “The Ballparks of Major League Baseball”. “Trivia” offers various fun facts, while “Ballparks” gives us info about all 30 major league stadiums. Both are nice additions to the set. So what extras does this “Anniversary Edition” drop from the prior DVD? The most significant omission is “The Field of Dreams Scrapbook”, an excellent documentary. We also drop the movie’s isolated score, many production photos, a trailer, and other stillframe materials. All of these are quite good, so their absence acts as a disappointment. 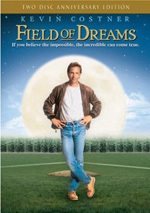 While I was prepared to dislike Field of Dreams, I actually found it to be fairly charming and entertaining. Whatever aspects of the film turned me off in the past melted away as I got caught up in its gentle fantasy and emotion. The DVD presents very good picture, satisfying audio and a generally nice roster of supplements. I like this release of Dreams, and it clearly offers a better representation of the film than the original DVD did; this one boasts much improved picture and audio. Unfortunately, it drops most of the extras from the prior package, and many of those are painful omissions. If forced to choose one over the other, I’d go with this “Anniversary Edition” because of the superior visuals and sound. However, both are good to have, at least if you like bonus materials; the ones on the original disc remain valuable.